In contrast to other restaurants who appear to be abandoning healthier fare (because no one is ordering it), Hardee's has introduced their first salad, the Red Burrito Taco Salad. Whether this salad qualifies as 'healthy' is up to you: 860 calories, 55 grams of fat, 60 grams carbs, 90 mg cholesterol, 1720 mg sodium, 38 grams protein. That's more calories and fat than two (2) of Hardee's Cheeseburgers. In keeping with the marketing for their giant Thickburgers, Hardee's is calling it a "hearty entrée salad." Selling for $3.99, the Red Burrito Taco Salad is a bowl-shaped tortilla shell filled with seasoned ground beef, Monterey Jack and cheddar cheeses, shredded lettuce, refried beans, sour cream, hot sauce and spicy pico de gallo salsa. Sounds yummy. I'm surprised it has so many cals, though. I'll have to try it at least once, though - even if it means walking for 30 minutes longer than normal for a few weeks! Had I bothered to look at this info before I went to Hardees, I probably wouldn't have chose this, but since I did I may as well tell you how good this salad was. 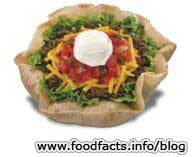 I really think this is the best taco salad I've ever had. It isn't real big but is very filling.